Google today improved its Google Flights tool by adding the ability to predict flight delays. The company is pairing historical flight data with machine learning algorithms to determine delays before the airline itself can. Google said it will only flag delays when it is 80% confident the flight will be postponed. People can simply search for their flight by number or route to see information regarding the flight’s timeliness. In another update to Google Flights, the tool will now provide people with more information about fares, such as whether or not they include baggage fees or the ability to select seats when booking. This tool is first available to Delta, American, and United. The new features are built into the latest version of Google Flights. Google today said Google Assistant will play a greater role in alerting travelers to delayed flights. The Assistant has been sharing delayed flight predictions since earlier this year. 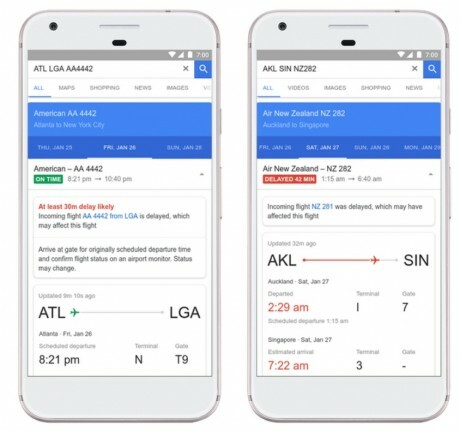 Google today improved its Google Flights tool with new ways to track not only flight times, but flight pricing. Moving forward, Google Flights will alert users about potential price increases. Google today updated several of its travel tools in ways that should help people find the best, least-expensive options when traveling. Google Flights, for example, now includes tips under search results, such as when prices are abnormally low or high. Google today announced a new feature headed to Android phones that should ease Bluetooth pairing pains. The tool, called Fast Pair, makes discovering and pairing with nearby Bluetooth devices much simpler. Google today improved the way Google Search finds and sorts hotels and flights when planning trips. To start, searching for hotels should now include better price filters and quickly discoverable details, such as hotel amenities.